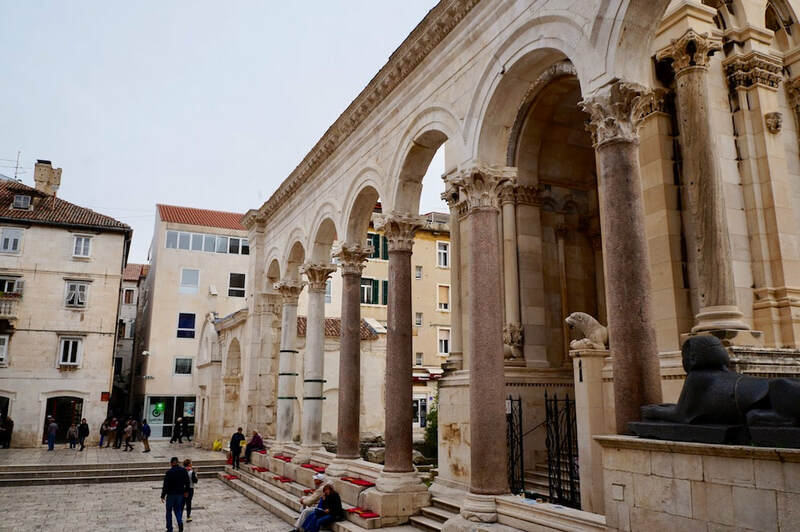 Built between 295 and 305 AD, the Palace of Diocletian in Split is one of the great treasures left from the power of Rome. This luxurious fortress and palace was built for a man who rose from poverty to ultimate greatness while revising every facet of Roman life. Diocletian has a bit of a bad reputation for persecuting Christians but, in fact, they were misbehaving so terribly in their inter-Nicene quarrels that they really needed a firm hand. He ordered that no blood would be shed but the Christians had irritated everyone by that time that given an opening, local governors and magistrates throughout the Empire hammered them. ​He was a tough, practical manager who left the Empire with a working tax system, small political units putting the power closer to the people and a professional army which saved Rome's bacon for another hundred years. He, well, deserved Split. Diocletian was the first ruler in history as far as we know to voluntarily give up power. 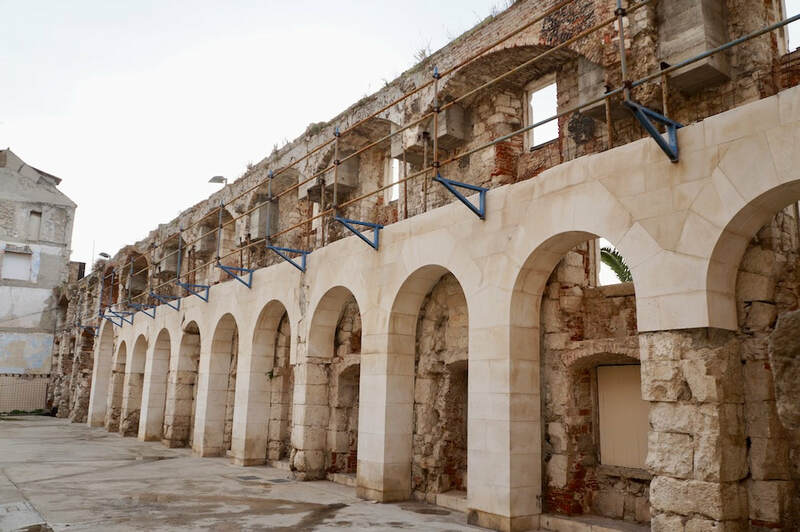 Once he reached the age of 60 and after he has placed in the Empire effective management mechanism, he decided to build himself a retirement place in Split, a seaside Palace easily defensible. ​Retired on 1 May 305, he tended his garden and each time he was enticed to again rule, he invited those who asked him to come and see his cabbages. Split is like his hometown as he was born to a poor family (maybe a freed slave) in the small village of Solin just outside of Split on December 22, 244 A.D.
Half for Diocletian and half as garrison for the imperial army, built from local lime stone and white marble, the Palace is certainly the main attraction in the city of Split today. In this Palace, Diocletian's remains were buried but this resting place is now a Church, sort of a statement against Diocletian who martyred so many Christians. 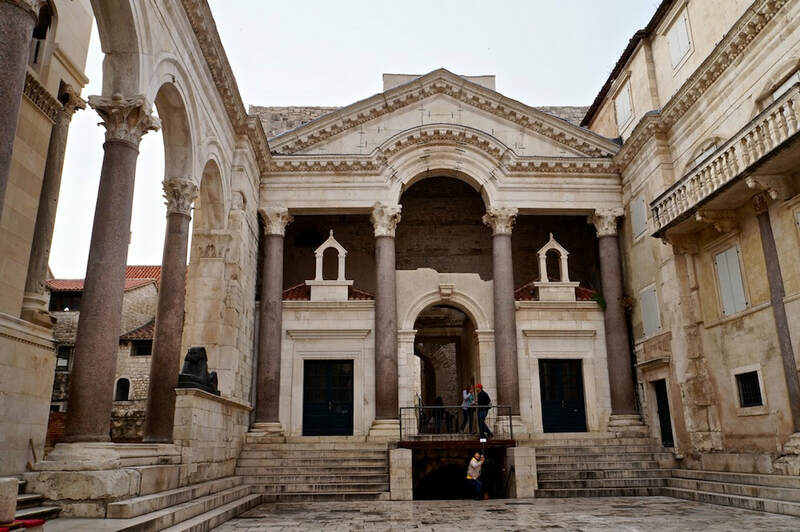 ​Why is Diocletian's Palace Interesting? The Palace was almost forgotten until the 1760s when a Scottish architect Robert Adam has the Palace surveyed and a book was published with its details. The buildings are really important as it is the most complete remains of a Roman Palace. ​​The mix of castle and fort really make it interesting. Diocletian has apartments along the sea walls. At its peak, it housed around 9,000 people. ​Enough of the Palace remains today that you can sit quietly and paint a memory of what life might have been like within its walls. There would be behind the walls scuttling and scuffling, that pales the like of Downton Abbey, by hundreds and hundreds of service staff but equally, there would be the noise of the markets with local farmers providing food both for the Palace and for the Legion of soldiers living within the compound. ​This mix of castle and garrison would not be perfect for anyone but it provided a perfectly secure retirement home for a reasonably controversial emperor. 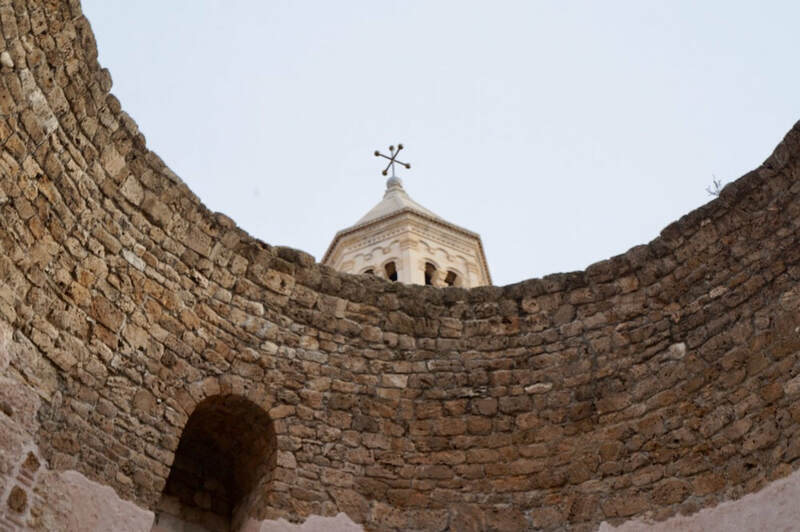 Recent Palace archaeological discoveries uncovered water wells that predated the Palace construction, remains of an old medieval olive and wine press and also more of the decorative things used during Diocletian's time. Here's a short video you can watch of the Palace in Split. 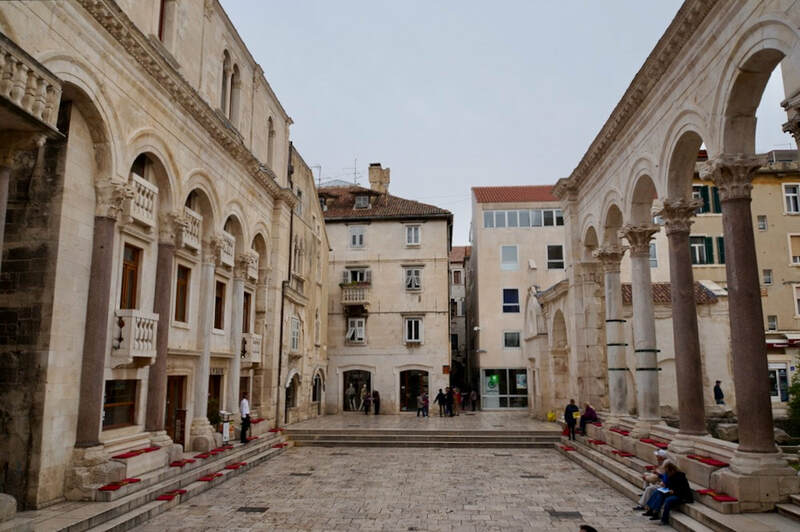 Today, the whole complex has become Split's Old Town and around 3,000 people live here but many more work here in its hotels, apartments, shops, restaurants, coffee bars and other tourist services. ​An unforgettable experience in this place is listening to the Klapa Dalmatia. Four singers, not your usual long haired tattooed ones, but dressed as in formal orchestra suits, sing some of Croatia's traditional songs under the Dome . With outstanding acoustic, their voices fill the place with music that makes you stop and listen. ​As you listen to their singing, look up to the old Sphinx brought all the way from Egypt quietly seated on the West side of the Peristyle, the square surrounded by huge columns. ​If you have a voice to be proud of, join them. They do encourage this. The tenor was really happy when my husband joined them and sang his heart out that after that, he would always go through that dome just in case the group is there and he could again sing with them. Featured in the fourth season of the Game of Thrones, the Palace is again gaining significance. New developers at one time wanted to put a parking lot underneath but when the public heard of it, the proposal just died. They did not have a similar vote on hosting the Game of Thrones. ​While it has the protection of the UNESCO World Heritage Site, there is greater power from the local community in the preservation of this special place for the next generation and as their livelihood depends on it, the protection is assured.